I have tremendously enjoyed taking a few days off this week – as much as any mother of four can take a few days “off”. I have read more, slept more, worshipped more, “blown more bubbles” (my term for whiling away the hours with my children–in their love languages) and wondered why I don’t do this MORE?! In these days of rush-hour lives, it seems almost impossible to slow down and fight against busyness (B.U.S.Y. = bound under satan’s yoke) to enjoy each other. It’s easy to let hours, days or years go by and wonder where they went. Families need to combat the unraveling and stay tightly knit; one way is through family traditions. “Chips!” my three-year-old screamed when he came down one Christmas morning, despite the toys that surrounded the chips. On video, it truly sounds like a 4-letter-word, but our funny home video reminds the Bradys that Christmas mornings bring chips, since our son’s food allergies prevented the “normal” Christmas morning sweets. 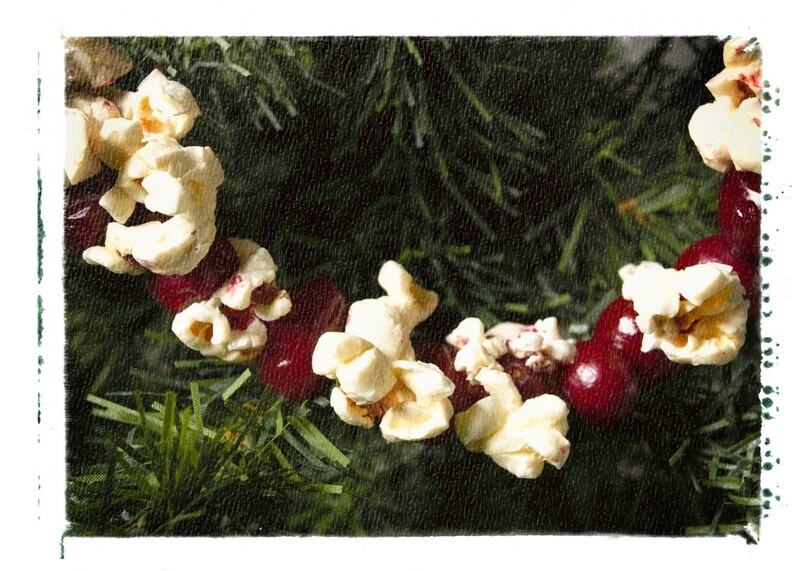 As Christmas approaches, fresh cranberries are strung with popcorn to hang on the Brady tree; Chris’s favorite cookies are decorated, and the Legend of the Candy Cane is repeatedly read. Dad’s calendar is opened to reserve a day for “stealth” family shopping and an evening for ornament painting. We buy (or make) one new labelled ornament for each child, so when he or she leaves the home one day, his or her new tree will bear years of memories on which to build new ones. Some traditions bless others while creating family bonding. When I was growing up, my mother would volunteer to work holidays at the nursing home where she was a nurse. My father, brothers and I would then join her and convene with the elderly, bring dessert and lead singing. My 14-year-old son recently worked 5 hours at the Operation Christmas Child warehouse – something that could become a tradition as our family gets old enough to participate. Caroling in the neighborhood, adopting a family, cleaning the house for toys & coats to donate, visiting the sick, and making cards for the elderly are great ways for the family to act as a team in blessing others. Most important would be those traditions that revolve around God’s message to us. Traditional attendance of a church service, memorizing Scripture, and singing songs are wonderful “habits” for my children to take along to their own families one day. One family of nine visited us last Christmas and simultaneously recited all of Luke Chapter 2 at the dinner table (upon our request once we heard it was in their repertoire). What a great family Christmas tradition each of the children will remember forever!! What are your traditions? I would love it if you attached a comment below with a tradition- even if it is one already mentioned -even if it seems silly, like “chips!”. (note: Comments here stay with this letter, although Facebook comments disappear with the timeline.) You may inspire another reader -including myself- with a new tradition that knits families for generations to come. This entry was posted in Married Life, Motherhood, Rooted in Faith, Uncategorized and tagged Christmas, Family by Terri. Bookmark the permalink. I want to thank you for your amazing posts. I enjoy reading each and every one of them. You have such a gift! It’s my daily dose of inspiration. You have always been my favorite leading lady. Thank you for sharing your wonderful gifts with all of us. Wow! The thought of our kids taking a set of ornaments they had collected their entire life when they head to a home of their own really inspired me this morning. One of our traditions growing up was to go to “Grandmas” house, and she would read some of the Christmas stories to me and my 5 younger brothers and sisters on Christmas Eve. Silly stories about puppies, and Christmas. I will have to check in with Mom to remember their exact names. Now, I take my 4 little girls, to that same living room, sit by the same fire place, while my mother reads out of those same raggedy children’s books, the same stories I once listened to. Luke II is always read as well. A tradition that brings tears to my eyes, as my grandmother has been gone for 8 years now. I am a big fan of traditions! I thank you for sharing some of yours Terri! Happy Holidays! May yours be filled with the spirit of Christ! by Barbara Robinson, a chapter each night. We LAUGH OUT LOUD as a family at the funny pageant, while taking the message home, too. I LOVE that you are able to have your parents involved in your traditions. It extends the family bonding and the memories that bring tears 🙂 ! We just started this one tonight, Terri! Thank you for sharing and contributing to the laughter in our household this evening! We have a Christmas Eve tradition called midnight turkey. It originated from my husband’s and my first Christmas together, and first time cooking a turkey too, for that matter. Due to mishaps like an insufficiently thawed turkey and my husband having a longer work day than usual, we didn’t sit down to our Christmas Eve dinner until midnight. Our first baby was ten days old, so we were getting used to keeping odd hours anyway. We decided to make it our first family tradition, and in a following year when everything was going wrong and I was on the verge of tears my husband gently reminded me that the point wasn’t to have everything be perfect. It’s about having things go wrong, but it’s okay, because we’re with those we love, and we can enjoy it and make the best of it. Awww! This made me cry. I love when God uses our bad days to make good – like a new tradition. What a great husband you have to remind you of what is important. I so enjoyed this post. The family tradition that I brought from my youth to my home is the tradition of “Potts Punch” which is my maiden name. It is a recipe my father created and we affectionately say “it’s like crack” because it can kill. My children absolutely love it, mainly because it is filled with way too many “sugary” crystals. A tradition that Raymond and I have created is decorating our family tree, the stairway and any place a build or ornament will fit and then taking our own family photo at home. It is a blast, since none of us have ever taken a photography class, the lighting is truly rigged and often it takes way more time than a Olan Mills or any other photography studio, but the bonding and memories are priceless. Last, but certainly not least every year our church has a Christmas Eve Candlelight Service, which truly engages our heart to the real reason for the season. I LOVE Family Traditions as well and over the past few years its been really hard to keep some of the ones we used to have. In my family, on Christmas morning, my mom always makes her special sausage biscuits for whoever happens to be around and although they are incredibly easy to make I can’t ever remember eating them except on Christmas morning (now that I’m older I know they go perfect with a good cup of coffee!). Of course when we were younger Dad always would read the TRUE Christmas story and now whether it’s read by Grandpa Chuck or someone else it’s still a BIG part of our Christmas day as well as singing “Happy Birthday” to JESUS! One of my most favorite traditions that I grew up with, having come from a catholic background, was celebrating St. Nicholas Day on Dec. 6th. The night before, each of us kids (7 of us) would line a shoe up and eagerly await the little surprises of candy canes, packs of gum and trinkets inside them in the morning. I continued this tradition with my children and although my daughter Nicole is now 15 and living with her dad she still brings me her shoe for “St. Nicholas” to fill! Being recently re-married, I look forward with anticipation to the new traditions that Matt and I will share with each other over the years! Brigette, I remember my neighbor from Germany celebrating St. Nicholas Day. How fun to have something in your family different from others. I like how you mentioned the new traditions with the new marriage. I am sure as death and divorce change families forever, it is more important than ever to have bonding rekindled. Some may want to take old traditions and continue them; and others will want to take new traditions (from this list of comments!) and begin anew. Either way, let the family-knitting commence! My favorite tradition of ours is going to Midnight mass with my husband’s entire family. What greater gift is there than to share the celebration of Christ with our families?? After getting home (at a wee 2am usually) we let the kids open their presents, and then its off to bed to get ready for a lazy Christmas of Klinga (a traditional Danish pastry) sweets, and reading The Nativity and The Polar Express. Thank you Terri for reminding us to “blow bubbles” with our children. Through all of the hustle and bustle of the holidays, I think we tend to forget what the true meaning of Christmas is. This year we will also be donating toys to a local charity for kids who might not receive a Christmas this year. Our children will be choosing one of their own toys to give away as well. Our family tradition started the first year my husband was in seminary in 1966. We had never had a nativity scene, but I found one in a 5¢ & 10¢ store (way before your time!). It was plaster of paris and even had a wooden stable. Every year when it was time to put the set away, I wrapped the characters of the tableau individually in white tissue paper. Then the next Christmas, it was a special treat for the children to shut their eyes and choose a piece to place in the stable. Everyone hoped to find Baby Jesus when they unwrapped their piece. My children’s ages span 23 years, so we always waited until the ones in college arrived before setting up our nativity scene—they didn’t want to miss out! When we retired and moved from the family home in ’08, the original set went to “live” in our daughter’s home where her children can continue this tradition. Lalanne, I am so excited that YOU would share! I first heard the acronym, “BUSY,” from Gary Hallquist, our mutual friend. I LOVE the idea of unwrapping the manger scene! Simple, and it’s wonderful that has been passed on to the next generation. My husband and I had the joys of merging family traditions when we first got married. At times my ideas seems crazy to him and vise versa but after talking through them we began our own family traditions! The traditions evolved when we began having children. We make ornaments every year for ourselves, our boys, and the grandparents. Lately I’ve been trying to make sure Christmas is about the celebration of Jesus’s Birth, not about santa. It was after a bedtime prayer with my oldest son last year when he thanked God for having Santa being born oh and Jesus too. It made me realize we missed the point of the season. So we are making a few alterations to this years traditions, to keep Christ in Christmas. Thank you for your inspiration to do more and to get better! We have a felt countdown calendar where each day you take one felt ornament out of its pocket and pin it on the felt tree. My brothers and I did this as kids and my parents gave us the calendar. Now my kids enjoy putting up an ornament each day of December as they count down to Christmas. Terri, Every day that I read your post I just want to cry! You ALWAYS have such uplifting words and you ALWAYS make me feel so loved even if its not a message to me. Thank you for ALWAYS being that positive light to this world and being the AMAZING woman you are! I have to agree with Jackie, you are my favorite speaker!!!! (I love stories!) You always find a way to touch peoples hearts and your warm smile melts away those calloused spots on people heart from hurt and pain. I remember mine and my sisters FAVORITE memories of CHRISTmas time, Christmas eve would be at my Grandma’s house (dad’s mom) all our family would get together, eat lots of food and play games till the children fell asleep during them. Then off to our house we’d go with knowing in about 7 hours we would get to go back to start Christmas day there. Well actually my sisters and I would go wake my parents up at 6am to open gifts at our own home then still in our PJ’s we would get to Grandma and Grandpa’s house to meet all our family again, have this AMAZING breakfast (which my grams cooked) open gifts(great of course) but the best part was, every year we would get a can of silly string and out side we’d go and the family of 2 grandparents, 3 sons with their wives and all us children would have a silly string fight on their property. Pictures were taken and many memories made! My grandma got sick Oct of 2009 with ALS, a very fast on set and unexpected illness. The doctors did not give much time and said we only had a few months left with her 😦 For the last time our WHOLE family forgave and moved past 10 years of heartach to bring one last Christmas to my wonderful and amazing grandma. Her last Christmas was spent with the whole family surronding her and loving her. She passed away January 21, 2010 😦 She forever built a tradition that I will never let go and bring to my family whenever God chooses to bless us with children. Thank you for asking for the post. Its been hard to not focus on the loss of the person I loved sooooooo much but I now remember the wonderful times and memories I have had throughy my life with her!!!!!!! How fun that I came to read this post of yours not two days after instituting a brand new Christmas tradition in our home. Last year our son was only 3 months old and so we didn’t get around to starting any traditions specific to our new(er) family unit, but this year we started something I call Christmas Kickoff. I posted a recap of it on my own blog (http://bit.ly/vvcGUH) with more details, but essentially it’s a pre-Christmas gift swap where we exchange presents that are best used to get in the holiday spirit before the holiday instead of the day of. Things like Christmas movies and decorations… and holiday pajamas… I can’t resist themed pajamas! excellent post as always, terri! hmm..traditions…well: dave buys me one ornament every year. we started that our first year together (1976). i LIKE the ornaments for your children idea…fabulous way to make memories. one year when the kids were little..it was Christmas Eve, presents were wrapped or assembled and we were whipped. the kids asked for McDonald’s for their dinner (food from any place other than home was a rarity and a treat!) and Dave & I got chinese. fast forward many years: now we ALL have Chinese on Christmas Eve! another tradition: we do not celebrate as our generation’s parents used to! Dave & i also host a Christmas Day dinner at our church for people who have no family near by. we supply a turkey, a ham is donated, and a favorite dish is brought by all who come. it’s a beautiful way to share the spirit of Christmas. when i was younger my grandma would have a happy birthday jesus party. so i still do this every year. it doesn’t matter how old they get. they love it. The family tradition in my family is we always have gotten together at grandmas house after opening presents for breakfast. The “must” at breakfast is the real sourdough pancakes, and my moms sausage gravy! We did this my whole life untill I was 23(our family has grown to large to house us all with the over 13 grandchildren who are married with children) the past four years we have been on a quest as a family to start our own traditions and the thing I hear over and over again is why can’t we go back to breakfast at grandmas. I think this year with both my brother and I having kids now we should do breakfast at grandmas house(my moms). Thank you Terry for sharing your Christmas traditions. Here are a few of mine I started with my daughter and nephew and neices and I continue now with my three grandchildren who I have custody of. music, reading christmas stories from a set of little golden books I have had since my daughter was about 2. Putting up the tree and my christmas village and teaching the children to look with their eyes, but they have to keep their little hands behind their backs. Terri, this is such a fun post, as I’m always interested adding new Christmas traditions. They are so important to pass on from one generation to the next. My husband and I have a few we’ve started and a couple that have been passed down. Every year we find someone we can bless in some way. We too started letting the children pick out a new ornament each year from the time they “could”. It makes for an interesting tree,lol…. (I think this year we”ll be seeing Yoda and a new Star Wars ship added). It’s fun and the kids sure do feel appreciated! Of course, there are more adult like decorations that adorn the tree:). A few years back Focus on the Family made an “album” of Christmas Adornaments. It consists of 12 nicely illustrated ornaments on which each bare a scripture reference to the Names of Christ. There is a matching booklet giving mini messages about each of these names, so we have specific devotions to Christmas the 12 nights leading up to Christmas. Christmas Eve we make gingerbread houses and drink eggnog:) My husbands grandmothers’ tradition was to make homemade ravioli on Christmas Eve. I have not been consistant with this EVERY year, cause as you know, it’s alot of work!!! Ok, so I guess I better go find that crank and clamp,lol…… Lastly, one passed down from his family as well, we let the children open one small gift Christmas Eve. Usually its a stocking stuffer. I’m not sure why this was started, but it appeases them enough to get a fairly decent nights sleep:) Thank you for all that you do and all the inspiration! God Bless! Funny, this year a tradition started in our home that’s been all year ’round. At bedtime I sing to little ones so I can get the lights off asap… 😉 For most of this year Alec, 4, has requested “Deck the Holly” (Deck the Halls, but i like his title better) it’s our tradition every single night. So, we’ve been singing Christmas songs all year long. He likes that particular one because we had a book with the lyrics in it. The book has been M.I.A. for a long time and he kept asking where did the book go? I didn’t remember. When we unpacked the stored away Christmas decor there it was along with the rest of the Christmas books. He lit up! We’ve read it several times together over the past week and, of course, he already has it memorized! My favorite Christmas tradition is one that my mom started ages ago. She struggled with celebrating the true meaning of Christmas, especially with all the gifts & fun & excitement (all great things, too!) on Christmas day. So she reserved Christmas Eve as a special, spiritual time for our family. That evening, we have a quiet, simple dinner reminiscent of the one Mary & Joseph may have had in their humble circumstances that night. All the lights are turned off in the house, except the ones on the Christmas tree, and we eat by the light from the fireplace and candles. Instead of eating in the dining room, we sit on the floor in the living room around the coffee table. We tear round loaves of bread and eat cheese, olives, and simple fruits. We discuss what Mary & Joseph may have been feeling and read Luke 2. Sometimes we watch The Nativity, a short video. I always look forward to that break from the world when we come together and share the simple, miraculous joy of the season. Our family has many Christmas traditions, some lifelong, some new. When I was a child we all went together to midnight Mass . It is a tradition I continued even when I worked midnights as a nurse. Today that has changed to a Christmas eve children’s Mass where the gospel is proclaimed by the children. After Mass we go home, have dinner together and spend the evening playing dominos and telling stories. My mom knitted us stockings to hang on the mantle, each with our name and the year we were born. As my siblings have married or had children of their own she has knitted them stockings as well, but their stockings have the year they joined our family. It is a joy to go to my brothers homes and see the stockings hanging on the mantle! My sister-in-law Connie (really a sister!) and I have a tradition of baking Christmas cookies almost every year. Her boys are grown now, but they still request certain cookies and have expressed extreme disappointment the 2 years (out of 28) that we did not bake at all. We use these as gifts for friends. My parents started a tradition of adopting another family for Christmas. It is a tradition we continue until this day. Lastly my father’s side of the family has a reunion every year during the Christmas holidays. Each sibling rotates who is in charge from year to year. My dad died in 1978, and I am grateful to have such strong family connections to his side of the family. This year we will meet on the 26th for brunch and seeing how the family has grown! I have apprectiated seeing other family traditions and am picking out a few to incorporate as my own family expands! Hi Terri, thanks so much for this post for reminding me of such special things at Christmas time. In our house every Christmas morning we always have Hot Chocolate the kids never let me forget, and we can’t forget the whip cream! Also i love the making Ornaments never thought of that, but we do by one ornament every year new for each one of our 4 children. Also every year on black Friday we go and shop and always go have breakfast at the same place. The kids love all the excitement! i am looking forward to adding a new tradition this year, by our house there is a LIVE Nativity scene and its a whole reinactment of the night Jesus was Born, its a live walk through its AMAZING!!! Also the reading of Luke 2 on Christmas eve 😉 Thanks so much for being an Awesome Leading Lady! What an awesome post about traditions! We merged traditions between my family’s and my husbands when we married years ago, and have acquired others over the years. One of Bob’s tradition was and is Spritz Cookies. Until recently, I baked all our holiday goodies but those (son David took over a couple of years ago), and they are still Bob’s thing. Anyone can assist, but we all know it’s Bob’s job to run the cookie press. Another tradition our son David took over from me was decorating. He festoons garland, posters, plaques, special wall hangings and other stuff all over our house. He just goes nuts with it! I always decorated more than my folks did, and David goes way beyond me. It just doesn’t seem like Christmas around here without the snowman card holders, the reindeer, the angels and the manger scene. An essential tradition is Christmas Eve candlelit service. We tend to go to the later one at our church, because the earlier one is crowded and noisy with families and young children. It is a great time to center on the reason for the season. Our final tradition is our Christmas videos. “White Christmas,” “The Polar Express” (a MUST for Christmas Eve after church! ), the “Santa Clause” trilogy and of course several different ones that tell the Bible story are very much a part of our Advent viewing. We also try to catch “It’s A Wonderful Life” when it airs on television, as well as the Trans-Siberian Orchestra PBS specials . . .
Good evening, Terri! Thank you for the wonderful stories and words of wisdom that you share with us. We have a family tradition that my Dad started when my brother and I were kids. My Dad was in the Air Force, so we always were states away from “home”…which is Texas for all of us. None of our families traveled to come see us for the holidays, it was always the expectation that we would come home to Texas. Most years we did, but some years we couldn’t for various reasons. So, one year when I was about 6 and my brother, Trey, was 9, my Dad decided that we needed to have a dinner that made us feel like we were at home in Texas. So, we cooked homemade enchiladas from scratch. It was Christmas Eve 1978. My parents moved back to Texas in 1983 and we have lived here ever since. No Christmas Eve has gone by that we have not had homemade enchiladas. My Dad and I are the chefs at this point, and I have grown to treasure this time with him…just he and I in the kitchen cooking, laughing, recalling old times, and making new memories. I have an 8th old son, and he all ready knows that this is one of our traditions…I also cook a stuffed French toast casserole every Christmas morning for my parents and in-laws for brunch. We all open our gifts from Santa together as a family, and then have brunch, and open all the rest of the gifts together. Looming forward to this Christmas!!! Thank you, Terri, for allowing me to share our holiday traditions! May God bless you and your family always!!! Thank you so much for your blog. I love reading your posts. I have always been big on family traditions. One of ours for Christmas was breakfast casserole. But last year I let the busy (being under satan’s yoke) creep in and I forgot to put in a pretty important ingredient. The eggs. We have laughed all year about this. How fun. We also started a new tradition this year. Since our daughters are in their young twenties and have moved out, we started having Sunday dinners to try to at least get together once a week and catch up with them. There were times this summer that they could not make it, so we extended the invitation out to other family members such as our parents, siblings, nieces, nephews, etc. We now have sunday dinner every week and have anywhere from 10 to 30 people over who all bring a dish to pass. We have had so much fun and have gotten to know our family better, told stories from all the generations. I could not ask God to bless me more in this area. This tradition has also encouraged more of my family members to go to church. I look forward to Sundays now and can’t wait to hear the next story. I buy my daughter and all my nephews and niece they’re own ornament every year as well. My hubby, daughter and I have a meat cheese and cracker tray and a goodie tray on Christmas Eve. We let our daughter open 1 gift, which is a game, and we spend the night playing thee game and listening to Christmas music, then when we’re done we take a drive and look at Christmas lights, then come home and watch my husbands favorite Christmas movie and enjoy a nice chip of my gma’s famous hot cocoa. Family traditions are great. Every year we also pick an angel of the angel tree to buy for. What a great post! Thank you so much Terri for inspiring so many suggestions and including some of your own! It has been wonderful reading the memories that are being made — I will be sure to incorporate some of them into our own family traditions (especially those that focus on the real meaning of CHRISTmas). – One of the memories I looked most forward to (and still do) is the time I spent with my very hardworking father! As I understood who really fills the stockings, I thought it was awfully unfair for my Mom to fill her own and miss out on the surprise. Hence, I encouraged my Dad to break his tradition of waiting until Christmas Eve to shop, and take me out for a shopping date to play Santa Clause for Mom! To this day on Christmas Eve, I fill my Mom’s stocking with the gifts my Dad and I picked out for her! – We celebrate Christmas Eve with our close and extended family on the “Eve of Christmas Eve” so that on Christmas Eve and Christmas our families can avoid the chaos of travel. During this special evening, the grandchildren put on a play. The “behind the scenes” is created during the month of December when my Mom spends special time with the grandchildren. – Christmas Eve my parents’ church has a service that invites anyone to share their God-given gifts with the congregation. Adults and children sing, play instruments, tell stories, etc. with the purpose of glorifying God. Finally, a couple traditions I have started in hopes of encouraging the real meaning of Christmas: baking a cake for Jesus and giving each child only three presents under the tree (the same amount of gifts baby Jesus received from the three wise men — which was just suggested to me this year). Family Traditions…..ahhhh such sweet memories! Every Christmas Eve my children got to open two gifts…..a new ornament for the tree that they too would take with them when it was time to leave the nest and a new pair of pajamas so everyone looked “crisp” in Christmas morning pics! We also went to a Christmas concert every year at a local church and my kids always got a kick out of Feliz Navidad, sung by the Spanish congregation. To this day when it is played we all go back quickly to that yearly tradition. My childrens last pair of “new jammies” is a full set of mens jammies…. The top going to my daughter in law and the bottom to my son…and vice versa for my daughter and her hubby….I have one last pair to distribute probably next Christmas! I love your blog Terri…you are Gods daily gift to many! Merry Christmas the the Brady’s! Thank you Terri for your question! We do have our traditions but I haven’t really thought as hard about them as I should, knowing that they will leave an impression fot the next generation to carry on so I really appreciate your inquiry. 30 years ago as newlyweds we started reading the historical account of the Birth of Christ in Luke every Christmas morning before we opened our gifts as it helped us to keep our hearts and minds on the real reason for that day. Also, in keeping with the Italian heritage, we have lasagna with our regular dinner of ham and all the trimmings. But my favorite is finding people and inviting them over for Christmas who would have otherwise have been spending Christmas alone and to help them feel like they are a part of the family (as querky as ours is) -no one should have to spend it alone! May you and your family have a Merry Christmas! When our children were young, they knew they were allowed to open their stockings even if we were not up with them. Then no other gifts were allowed until we read the Christmas message from Luke Chapter 2. The tradition of opening the stockings without us was never actually a reality because we got to the fireplace before they began, as we were as excited as they were! Many Blessings to all you and yours! Our family had several fun Christmas traditions. My dad and I (not being shoppers) would go shopping Christmas Eve day. Christmas Eve evening we would sit by the fire (i grew up in Seattle) play Pictionary, eat homemade apple dumplings, and we got to open one gift which was always a book. My mom also added an ornament each year for my sister and I so we had a lot of nice memories to hang on our tree when we moved out. Although my dad and I shop online now (very often still at the last minute) and none of us have fireplaces having migrated from the northwest to Phoenix… we still get together to enjoy many of our other traditions. Hello Terri. Traditions are so necessary. When I was still at home my parents didn’t really have any traditions except for being VERY busy at church as my father was the “choir master”. Although our Sunday School ALWAYS put on a very elaborate play, in which I always seemed to be an Angel and narrator. I guess that’s a tradition. But when we got married, we brought over some awesome and unique traditions from my husband family and created some of our own. In the first week in December, we invite as many neighbors, friends and family to come to our home and join us for a carols by candlelight… during which we read the scriptures of the christmas story. We do it this early because we feel it is so necessary to remind ourselves of the reason for the season before we get caught up in the hype, expenses and commercialization of the season. We encourage all children to come dressed as angels or shepherds, and give them freedom to “act out” the nativity story as it unfolds. There is no coaching of the nativity play, and it’s always so funny, cute and amazing to see the leaders emerge… one year our 3 year old daughter stepped up (much to the chagrin of the older siblings and cousins) and was telling them all what to do. The photos we have of that year are just precious, (the expressions on faces are priceless and tell the whole story). On Christmas eve, at some point before the children are in bed, my hubby sneaks outside and rings bells outside the window, and the children always get SOOO excited (sometimes scared) when they think they can hear “Father Christmas” (as we call him) and want to get to bed asap so they don’t prevent him from coming and leaving presents. Christmas morning gift opening is a big family affair… each person from youngest to oldest gets to open their presents one at a time while others watch and share in the excitement and pleasure. Over the years I have taken a few select photos of christmas events, and created a very unique “Christmases Past” album for each year from their first Christmas for each child. They do not have access to it, on the first Christmas that they are not living in our home, we present it to them, and make a big deal of giving it to them… to remind them of Christmases Past. I decorate/decoupage a wooden box to house their album and their childhood ornaments so they have a start for their first tree in their own home. Their box has become a treasured coffee table/ conversation center piece at Christmas time. I pray that the tradition will be continued in their families too. There are other traditions that we have that have already been mentioned here. Just an end note. We have come to re-think the “santa” philosophy that has been adopted by families throughout time. As soon as we can, in the lives of the young ones in our family now, we let them in on the secret that he is just pretend. But we encourage them to ‘play along’ because it’s fun. The reason why? … That same 3 year old I was talking about earlier, who is now 32, said to us, when she was about 9… “why should I believe you about Jesus, when you lied to me about the tooth fairy and santa?” Enough said. Thanks for your thought provoking and motivating blogs that help us all to crystalize our thinking on very important topics. We love your willingness to serve in this way Terri. Blessings to your precious family at this Christmas season.